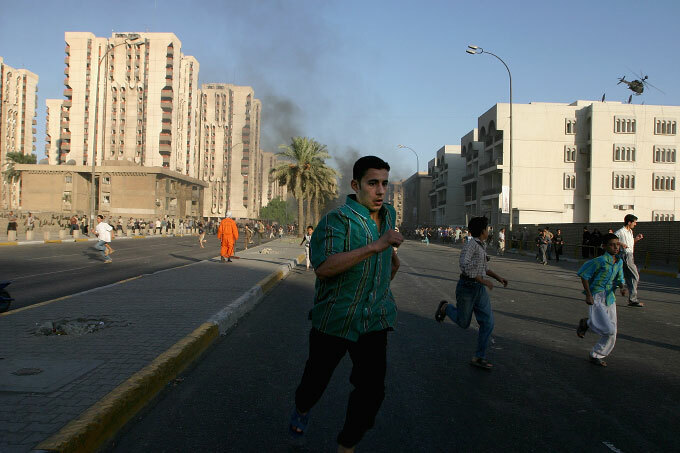 Iraqi civilians scatter in fear after U.S. helicopters opened fire on a crowd of civilians in Haifa St. in Baghdad. Earlier in the day insurgents on Haifa street had attacked an American patrol, forcing the Americans to abandon one of their burning vehicles. After a crowd of curious onlookers gathered at the scene of the burning vehicle and began celebrating the attack, a U.S. helicopter fired missles into the crowd, killing 22 Iraqi civilians and injuring 48.